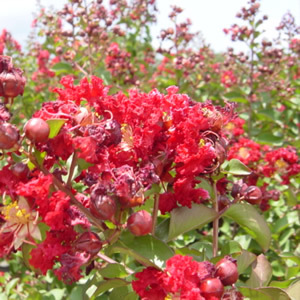 Another Carl Whitcomb introduction, Dynamite® Crapemyrtle grows upright and has leaves that appear crimson at first but change quickly to a medium green. Dynamite’s buds are crimson before flowering and bloom into cherry red flowers, these are more red than the cultivars that were available in the market previously. The flowers will be a dark scarlet red on hot sunny days and may be a lighter red that occasionally have white variegation on cloudy cooler days. Lagerstroemia indica ‘Whit II’ will grow to about 20 feet in height at maturity and is highly resistant to powdery mildew and also has some drought tolerance. For more information on this product and other Whitcomb introductions go to www.lacebarkinc.com.